In the last post we talked about kitesurfing which is one of the options we offer in our summer camp for teenagers between 14 and 17. Today we talk about windsurfing which is the other water sport teenagers can learn or improve during their summer holidays in Tarifa. Windsurfing is a much older sport than kitesurfing. Its beginning dates back to the early 30’s but the greatest expansion of the sport was around 1983/1984. Windsurfers such as Robby Naish and Björn Dunkerbeck were amongst the ones who catapulted windsurfing to fame. With the boom of Kitesurfing in the early 2000, noughties, windsurfing lost prominence. However, this has begun to change of late. Recently more and more young people choose to face the challenge of learning windsurfing. What is the motivation to learn windsurfing? Compared to kitesurf or other extreme sports, such as snowboarding , freeride mountainbike, a beginner in the windsurf sport certainly takes longer to reach a level to enjoy the sport. Windsurf can be compared with learning chess as in both disciplines there are several parts moving in different directions and have to be coordinated somehow. 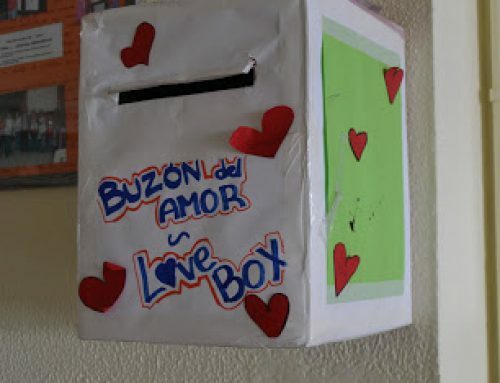 But generally after a few hours the student, especially a young learner, picks up quite fast thanks to sophisticated technical materíal whose standard increased a lot in the last few years. Whether somebody decides to go for windsurfing or for kitesurfing, the final decision is very personal and depends on individual taste. It can be compared with the decision to practise skiing or rather go for snowboarding. Is the windsurf sport safe enough to be offered to teenagers in a summer camp? This can definitely be confirmed. Windsurf schools ensure that it is as safe as cycling. 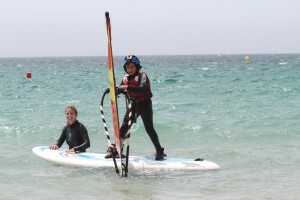 The recommended minimum age to start windsurfing is 5 years ( for young children special course material is used that adapts to the weight and size of their age). Of course being a good swimmer is an essential requirement to start with a windsurfing course. Beginners start to learn with a long board and a small triangular sail. These long boards guarantee stability and ensure that learners acquire confidence. Windsurfing has to be learned in a serious windsurf school that has all the right gear for all the different wind conditions that may occur in the spot where the windsurf course takes place. Tarifa offers an advantage for beginners. There is a lagoon close to the sea where the first steps can be practised should the sea be too choppy. In the lagoon the confidence to handle the material can be built up and then with this security students continue their lessons in the sea with no fear. Lenguaventura works with the Spin Out windsurf school which has the best reputation in Tarifa and is situated at the playa Valdevaqueros, the official windsurf spot in Tarifa. 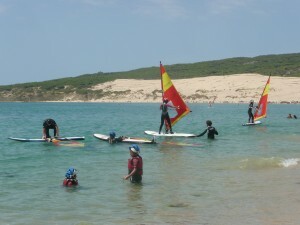 The participants in the Windsurf Camp can take a course according to their level which is determined on the first day.